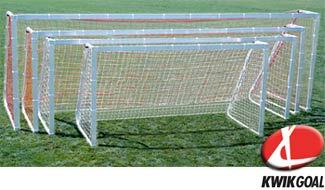 When your local Youth Soccer League demands the best, these are the goals for you. 2"D x 4"W aluminum, 3 piece all aluminum construction including backstays, one piece welded side construction and safe, smooth radius corners make these goals ideal. Recommended for goals that are frequently moved around. Includes ground anchors and net fasteners.